Such a sad sight. How old is this child on the left? Three years of age? What type of conversational skills are they developing? 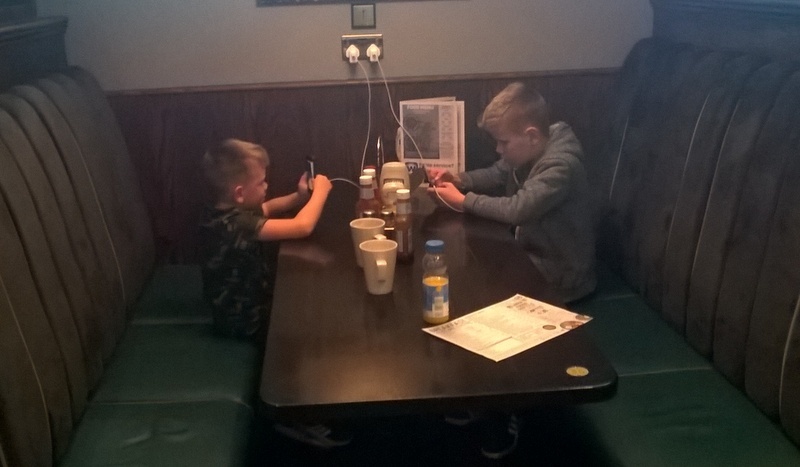 From the parent’s point of view the devices keep them quiet. What sort of parents will these children make? Today we had the pleasure of meeting Julia and Dave, two people who are dedicated to helping those suffering from electro-sensitivity. This is a condition not accepted by the deliberately ignorant government of the UK but in Denmark it certainly is acknowledged as a disability. For some time now I have been feeling unwell and getting unpleasant symptoms. For example, I get prickles in my head, feelings of disorientation and prickling in my hand whenever I hold the mouse. Their firm, downtoearthemf.co.uk offers the inspection of houses and offices examining them for dirty electricity (the effect when one field crosses another) plus unhelpful radiations produced by electronic equipment such as smart meters, mobile phones, wireless broadcasting points as well as lights of a certain type, mainly LED. I was horrified to find how much contamination there was in my office. Any live wire produces an electromagnetic smog. I have a tangle of wires beneath my desk which was causing measurements that went off the scale in terms of voltages per metre. This means that my own body has to try to earth these forces rather like lightning seeks a point of discharge. This is very damaging to a human body that has no natural defense against such waves. What I did not know is that even if the electricity is switched off, the wires still radiate. Julia and Dave recommend that you turn all electricity off at night and they say that the quality of sleep is enhanced. They had been doing this full-time for three years now so they should know what they’re talking about. The main culprit in my case was a router for Wi-Fi which was used to feed my sky TV with Internet using the mains of the house. What I did not know was that it was a Wi-Fi rebroadcaster as well, and our living room was being filled with this noise on a 24/7 basis. When we turned it off, we immediately felt an improvement in the atmosphere of the room. This is an example of the “boiling frog” syndrome when deleterious conditions increase little by little and you don’t notice the effect on you. Anyway they were measuring our rooms for about two hours and the results completely revolutionised my attitude to wires, cables, particularly , coaxial cable, messy wires. The biggest disaster areas are Dect phones, android phones, routers of any kind and of course smart meters. They could tell from their machines that there was a Testra broadcaster 2 miles away. Not only do they produce undesirable physical symptoms, but also result in a loss of concentration so the attention span of youngsters is decreasing. This is not a good sign for anyone who’s wants to study any subject in depth. It is part of the dumbing down of the population that we see most ingloriously in the United States of America, (look up “common core” education you want to be shocked). In addition, this influences coming to the United Kingdom made more easy by a preoccupied and indifferent government. The longer I can keep myself healthy, the more I can go on making a meaningful contribution as I have tried to do with these diaries and also with my 5G exposed.com site.